When site visitors first access your blog, they are initially presented with a special Welcome post. This is a great way to announce the purpose of your blog, and perhaps how you plan on publishing articles. Visitors are also able to explore your blog through various mechanisms. First, they can simply read your articles in reverse-chronological order. As such, they are presented with your most recent articles, and they can continue going farther back through your past articles. There are also three navigation components available. A Highlights component shows those posts you've chosen to highlight. A Tags component shows all of the tags you've assigned to your articles. An Archives component allows users to browse based on the publish date of your articles. 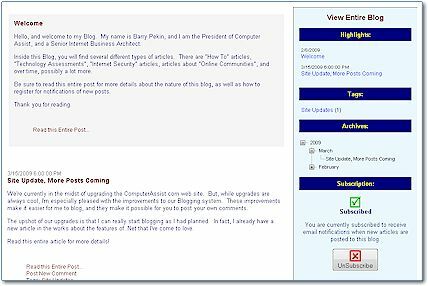 Visitors are able to subscribe to notifications of new articles posted to your blog. You can choose when to send notifications to registered users. Visitors can also post comments to your articles, which you can respond to directly to their email, or through posting a response comment directly on your blog. As the Blog owner, you can manage subscribers to your blog, moderate and remove user comments, and configure options about how your blog operates. These options include sending summaries or full articles in email notification, showing summaries or full articles in lists, setting how many articles are displayed per page, allowing and moderating comments, and configuring how email notificaitons are sent.